I can remember a time when my job as a home builder, designer, and retail furniture store owner had me dealing with endless paperwork, constant phone calls, huge crews, and super-long work days. As I crawled into the bed each night, I would say “one day” and fall asleep to the sounds of the ocean (played from a bedside speaker) as the snow was falling outside my window. My one reprieve was to read travel magazines. I studied them intensively, dreaming of what life could be like if I lived overseas. I admired the stories of the brave souls who took the leap, sold their belongings, and transitioned to live their dream lives. I knew in my heart that it would be me one day, setting out on a journey. I just didn’t know how to do it. All I knew was it would have to be somewhere near the turquoise glow of the Caribbean Sea. I wanted somewhere with great diving, sandy beaches, jungles full of monkeys, affordable travel to the U.S., with friendly locals and a great expat community, that was also safe for a single gal in her 50s. I had no idea when I landed on the island of Ambergris Caye, Belize that it would meet every point on my checklist, with the added bonus of being an English-speaking country with a currency that is pegged to the U.S. dollar (making conversion easy). I have spent years traveling to so many beautiful islands, even sailing my own 36-foot Endeavor sailboat throughout many parts of the Caribbean. I knew when I got to Belize I had found my spot of heaven. As a licensed real estate agent in the U.S., I was able to continue my practice in Belize, selling homes to people who dreamed of a better life, just like I had. To me, this island is an entrepreneur’s dream come true. If you want to run your own B&B, or perhaps try your hand at a restaurant, beachfront bar, or coffee shop, you can easily make it happen. If you wish to retire and relax, or even write that book you have been putting off, this is the spot for you. Since making my initial move, I have opened a real estate and design firm on the island called The Blue Water Collection, along with the island’s first “Southern” diner (named K’s Diner, after my mother). The expat community in Ambergris is very active, so there is always something to do. On any given day, I can grab a private boat captain and take an all-day excursion with friends to the far side of the island for $150. We head to excluded beaches to swim and fish, and have our catch cooked up for us as we watch the sunset over the waters. Those are the days you feel you are already in heaven. I can grab my frisbee and go to the sand bar in the ocean shallows with my dog, or head to the colorful bars and restaurants stretched across the sandy white beaches. The waitresses will still take your order ($3 Belikin beer) even when you’re lounging in the water, enjoying the island tunes. You could also grab a free kayak at the Dive Bar and paddle out to the reef, tie up to a mooring ball, put on your snorkel gear, and fall right into the most incredible aquarium you have ever seen. I can head to Mario the fisherman’s house and pick up lobster, or his fresh snapper, grouper, or wahoo of the day and throw an incredible beach cookout with bonfire and guitars included. Renting a place on the island is easy and one can rent a one- or two-bedroom condo or a lagoon-side or oceanfront home for $1,000 a month on average—less in town. I rent a two-bedroom top-floor condo directly on the ocean for $1,300. It hosts vaulted ceilings, balconies off every room, huge decks for entertaining, and I have access to our swimming pool and a restaurant/sports bar. My electricity runs around $150, and water/cable is included. I bought my own golf cart—this is how most people get around—but you can rent for around $40 per day or about $400 per month. You can purchase a cart for around $5,000. I also have a bicycle and I can ride it anywhere. 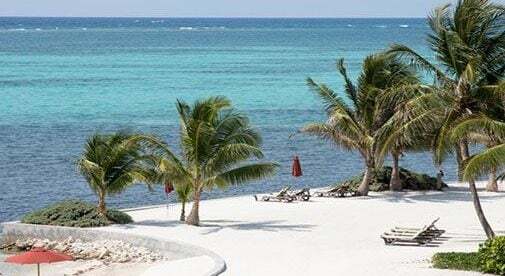 The weather in Ambergris Caye is one of my favorite things about living here. Having come from 10 years of shoveling snow in Colorado, I now wake up, grab my flip-flops, throw my hair in a pony tail, put on my swimsuit (one never knows the day’s adventures), put my shorts and t-shirt on, look in the mirror, say, “You look fine without makeup,” and I’m ready for the day. I am truly blessed and beyond grateful that my dream has come true. Taking this leap was the best decision I have ever made. I am truly a Belize island girl.